NOTE: The Hearth thickness is 50mm. Please ensure you have a survey carried out by a qualified Gas Safe registered gas installer to ensure the compatibility of your chimney / flue or intended location for a powerflue version, before making any purchase to avoid disappointment. This fireplace requires a class 1 chimney, class 2 prefabricated flue or Electric for homes with no chimneys, depending on the model you select. The above fires do not normally require additional ventilation in the room. Please note that all the above sizes are in millimetres (mm). 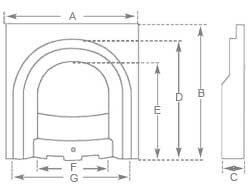 Output depends on flue-pull, diameter of flue and conditions of fireplace. Ensure that the room in which the cast iron product is being installed is thoroughly dry e.g recently plastered walls cause high levels of moisture in the atmosphere and, as a result, rust is almost inevitable. Under no circumstances should a Water-based cleaner or polish be used to clean cast iron products. Moisture is prone to dropping from the chimney, and is likely to cause corrosion. to minimise this it is recommended that you have your chimney swept clean and to seek advice regarding from your Gas Safe or Hetas engineer regarding the installation of a chimney cowl. 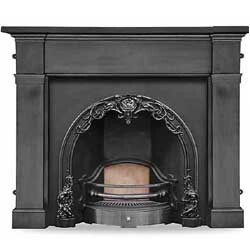 When using a gas fire, the products of combustion sometimes cause white deposits to form. These deposits can usually be removed with a soft brush. High temperature paint is used on all black finish items. This paint will eventually burn off. This can be maintained with our High Temperature Black paint available when purchasing the item. The delivery service offered on Carron products is based on a one man, kerbside, only delivery as the couriers are not insured to carry goods in to your property. Due to the nature and weight of this product the goods will arrive palletised so you will need to arrange additional assistance to offload the goods from the vehicle/pallet when they arrive at your nominated delivery address. All Carron products are delivered on a pallet normally by a vehicle in excess of 7.5 tonnes or more so please ensure to have adequate access and to advise us in writing by email if your property has any difficulties with access as soon as you have placed your order so we can look to make alternative arrangements to avoid you incurring additional costs in the event a delivery cannot be made if the vehicle cannot deliver safely to your location. You will also need to fully unwrap and visually inspect the goods on delivery for any signs of transit damage before signing for the goods in good condition in accordance with our terms & conditions on our website. All information contained in the website is to assist in your choice of a suitable fire and is not intended to rely on in full to organise your purchase. Before ordering please clarify with a suitably qualified installer to confirm suitability. If you would like further information on Solid Fuel, call the Solid Fuel Association on 0845 601 4406 or Email sfa@solidfuel.co.uk or to have a look at their website www.solidfuel.co.uk. Alternatively if you would like to find your nearest Hetas approved engineer, simply call HETAS on 0845 634 5626 or Email info@hetas.co.uk or to have a look at their Website www.hetas.co.uk where you will find a comprehensive list of engineer.